When it comes to structuring your theme, you have a lot of freedom as to where you put the files in the theme directory. So let's go ahead and look at several examples of different themes and how they structure their files for inspiration on how we might want to structure our own. 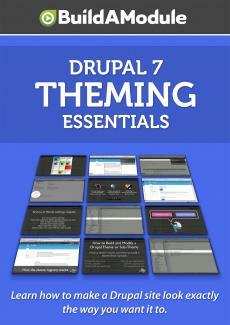 Let's go ahead and start with some of the core themes that come with Drupal. So what I'm going to do is expand the themes directory here and let's start with the Stark theme. Now, the reason why we want to start with Stark is because it's the simplest that a theme could possibly get. Okay. Now we have just five files it looks like here. We have layout dot css which contains some basic CSS for the layout, our logo file, the readme file that includes information about this theme, our screenshot, and our dot info. Now, we could actually strip out the CSS logo, readme, and screenshot and just leave the info file and that would allow us to enable our theme through the theme settings page. A couple of things to take note of here is that there's not templates that are being overridden. You don't see any dot tpl dot php files and there are no subfolders. So we don't have a subfolder for images or for CSS. Let's go ahead and take a look at a theme that does have subfolders. I'm going to go ahead and expand the Garland folder here and let's take a look at this line by line. So we have a couple of folders in this one and then we also have some additional files. The folders here are color and any theme with a color folder will typically be including files in that folder that line up with the color module that allows for a settings page to adjust the colors for the theme. So both Garland and Bartik will have this color folder. This also has an images folder that contains the image resources for this particular theme. Everything else though is in the base folder. We have command dot tpl dot php which is an override of the comment template. We have a couple of CSS files and when you see the ie inside of the name of a CSS file, it typically has something to do with Internet Explorer. So this is fix Internet Explorer right-to-left, rtl, and this if fix Internet Explorer. So this is for right-to-left languages like Arabic, for example, and then this is for any other language. Garland dot info is the dot info file. We have our logo file. We have an override of the maintenance page template file, an override of the node, and page template files. We have a print dot css file. Now, you'll often see CSS files split up into several different resources instead of one giant CSS file and a typical delineation is to put CSS that has to do with a print style in its own style sheet. That way it can be included separately when something is printed. And then we have style dot css down here for every other type of page or display. We have our screenshot. We have style for right-to-left languages, our template dot php file and our theme settings dot php file. Now, you may have noticed that there is a little bit of disjoint in this as we worked through these files because we have some CSS files and some PHP files and some image files all kind of grouped together. And as we're going through, this is listed in alphabetical order, and so finding something specific might take a little bit of work. There's not a lot of files here but if you imagine overriding a few more template files, adding a couple more CSS files, this can get pretty long. So let's take a look at Bartik which separates out these specific resources into separate folders.